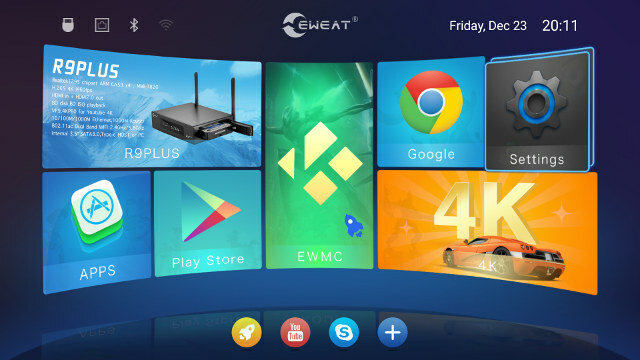 Eweat R9 Plus is a device powered by Realtek RTD1295 SoC combining main functions: Android 6.0 TV box, OpenWrt NAS/router, and HDMI recorder thanks to its HDMI input port. It competes directly with Zidoo X9S which has the same features, except while Zidoo X9S has no internal SATA bay and your 2.5″ hard drive just hang outside the box, Eweat R9 Plus comes with an internal 3.5″ SATA bay that makes it much neater on your furniture… We’ve already seen that in the first part for review “Eweat R9 Plus unboxing and teardown“, and I was impressed by the hardware, but the software is even more important, and that’s what I’m going to check out in the second and final part of this review. First Boot, First Impressions and Setup. I’ve first inserted a 1TB 3.5″ SATA drive in the device, and then I connected an extra USB 3.0 hard drive, HDMI and Ethernet cables, two USB dongles for MINIX NEO A2 Lite air mouse and Tronsmart Mars G01 gamepad, and a USB keyboard to take screenshots, as well as U4 Quad Hybrid Android TV box to the HDMI input. Connect the power, press the mechanical power switch on the back, and the device will boot, typically in about 40 seconds, to the main launcher. 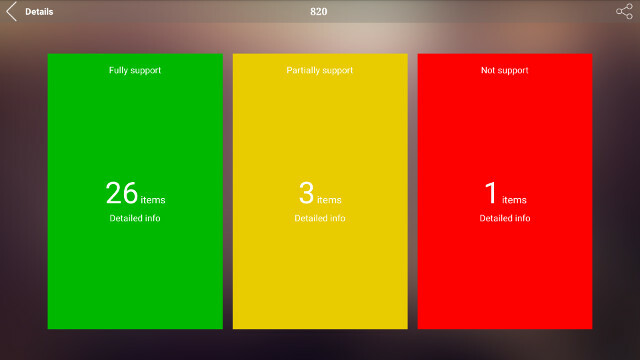 There’s no setup wizard like in Zidoo X9S, so you’d have to change configuration separately. 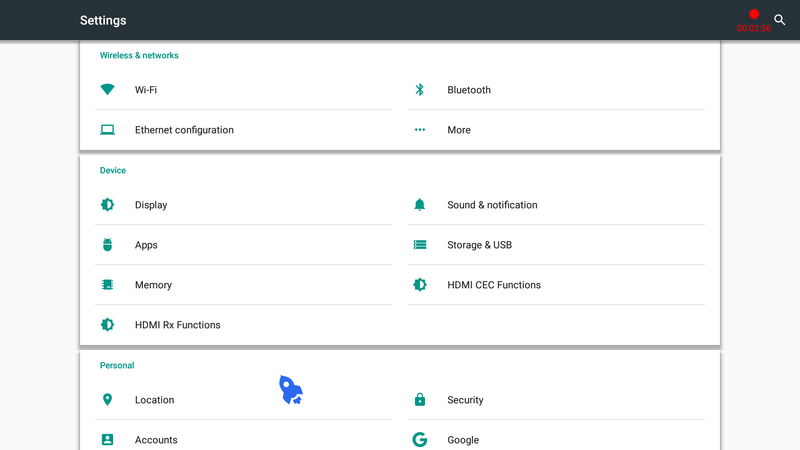 The top left corner includes status icons for USB, Ethernet, Bluetooth, and WiFi, and the top right corner shows the current date and time. The first time the time and date were not correctly update, and I did not get any IP address from my router… That’s because I connected the Ethernet cable to the WAN port, but once I connected it to the LAN port, everything worked fine. It’s just WAN and LAN markings are not quite correct…. Let’s go back to the launcher with 7 large icons, the “R9 Plus” icon is linked to Chrome browser (so we have two Chrome links), apps to the list of apps, EWMC links to Kodi 16.1, and 4K to the local file browser/media player. We also have 3 shortcuts on the botton that can be customized to your needs. Sadly, there’s no status nor notifications bars which can be a pain in some use cases. The small blue “rocket” on the of EWMC icon, is actually the mouse cursor (red in reality, but the screenshot app turns that blue). 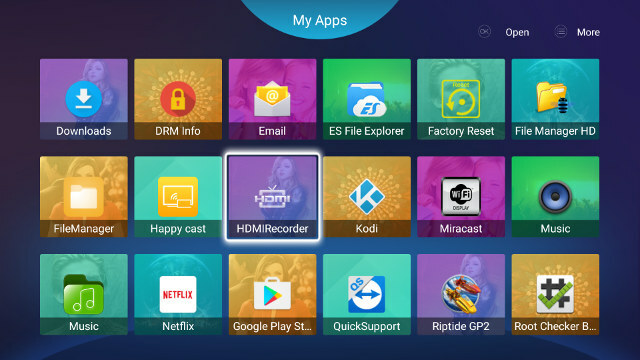 The system comes with a bunch of apps including Netflix, HDMIRecorder, and QuickSupport, and I could install my own without any issues using Google Play and Amazon Underground. The front panel display on the unit is a little more useful than most, as it will show the current time of the day when not playing videos or music, and instead display the current video time with 4K video player, but not Kodi, while playing media files. If you are interested to find out more about the settings, I invite you to check the Settings section of Zidoo X9S review, as Eweat R9 Plus has basically the same settings, except only “Auto 1080p24” option is available in the Display section, Deep Color Mode (AUTO, 12-bit, 10-bit, OFF) is gone, and the Playback section is missing together with “Auto 29.97/59.94 Hz”, “Force SD audio”, “Enable low performance mode (less buffer for playback)”. I could set the resolution (“TV System”) to 3840x2160P @ 60Hz without any issues, but I’ve noticed the video output will sometimes fall back to 720p or 1080p after a power cycle. I could not find any option to adjust overscan either, so I had some black zone on all edges of my TV. Those are issues, but the latter at least should be easy to fix via firmware upgrades. Once I found that LAN is actually WAN, and WAN is LAN, I had no troubles at all with Ethernet and WiFi, and OpenWrt options are also exactly the same as on Zidoo X9S. You only get 9.31GB of the 16GB in Android because some part is reserved to OpenWrt, but it still more than the 8.91GB I had on X9S. In theory it should be plenty enough, but after a day or two of use, my internal storage was completely full, despite not installing that many apps. 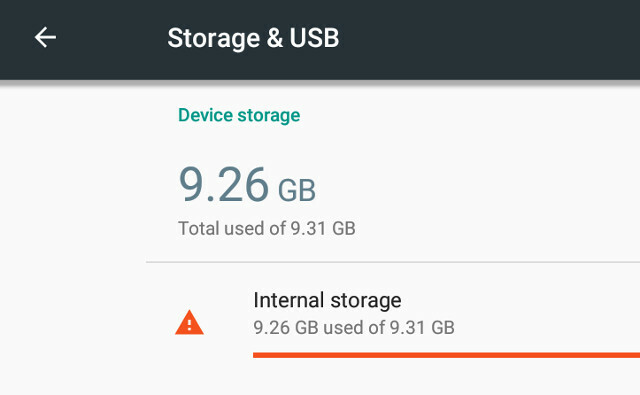 Eventually I found that since my 1TV hard drive had millions of files, Android’s “Media Storage” activity had created two very large databases. Disabling Media Storage fixed the issue, and after clearing the data from “Media Storage” I had close to 8GB free. Alternatively you can add an empty .nomedia files in the directory you do not want to system to scan, for example the root of the harddrive if you don’t want it to scan anything. 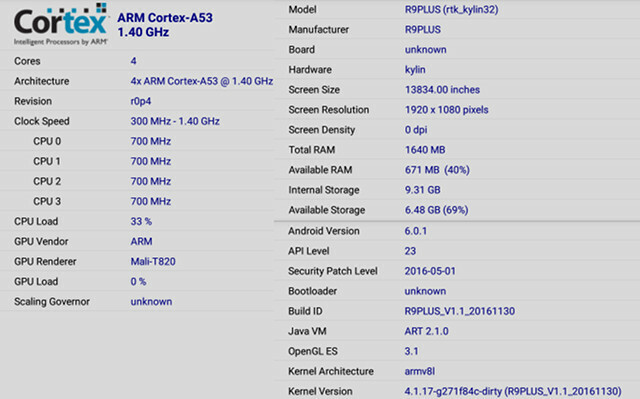 Going into the About device section, we can see “R9Plus” model runs Android 6.0.1 on top of Linux 4.1.17. 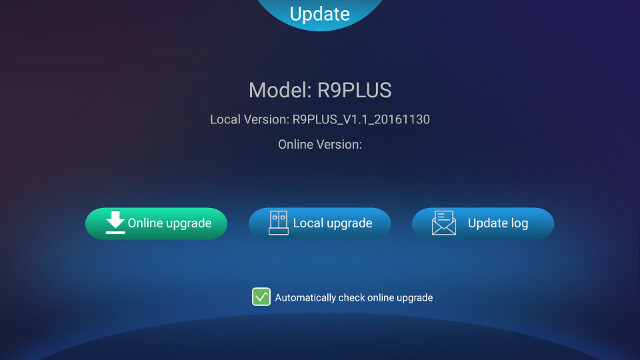 The firmware is rooted, and OTA firmware update is done with SystemUpdate app, and I could upgrade from R9PLUS_V1.1_20161130 version to R9PLUS_V1.02_20161217 version which I used in most of the review. I had to disconnect the USB drive, or the update will fail. You can leave the SATA drive inside the box during firmware upgrades. The update went well, and did not mess with my settings, apps, and media files. The included IR remote worked fine up to 10 meters, but I’d really wish higher end devices such as R9 Plus would ship with an air mouse by default. I had to jungle between the IR remote control and MINIX NEO A2 Lite air mouse quite often depending on the app I used. 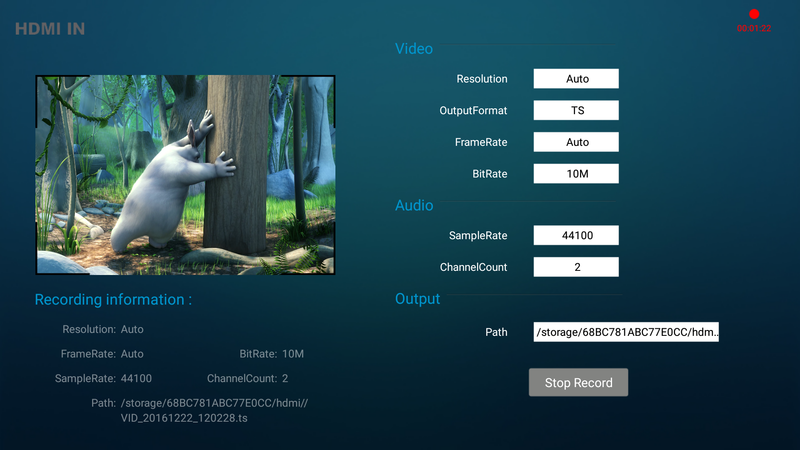 Realtek apps such as HDMIRecorder, 4K media player, and File Manger may work better with the infrared remote control. Eweat R9 Plus firmware is stable and responsive, but there are a few small bugs here and there that should be fixed, like the lack of screen scale option, video output resolution set by the user is not always used after a reboot, there’s no status nor notification bars, etc… I’d also wish such higher-end systems would come with an air mouse with keyboard by default to be able to fully control the TV box with a single remote. If you has a drive with many files, miniDLNA – enabled in OpenWrt settings as DMS (Digital Media Server) – will take a lot of CPU and I/O resources, so if you don’t need it, make sure to disable it. Idle power consumption numbers are with DMS disabled. While there’s no standby mode, we’ve seen with Zidoo X9S that standby mode is not that useful as networking and drives are all turned off. It’s just must faster to boot than from power off mode. 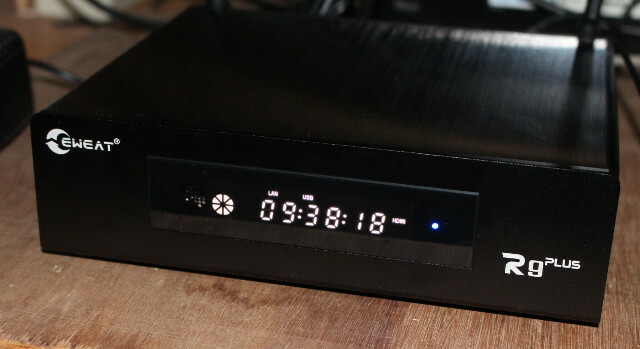 Most cheap Android TV boxes cannot handle more than one USB hard drive, but Eweat R9 Plus had no troubles with a SATA hard drive and a USB 3.0 drive. It might be possible to add yet another USB 3.0 drive, as the power supply has a 30 Watts capacity. It’s no surprise that with a large metal case, the device stays relatively cool at all times. The maximum temperatures measured with an IR thermometer on the top and bottom of the device were 35 and 37 °C respectively after Antutu benchmark, and 40 and 50 °C after playing Riptide GP2 for 15 minutes. R9 Plus comes with Kodi 16.1 (EWMC) and 4K app to browse and play media files with the internal player. So I’ve started by testing 4K videos with both. 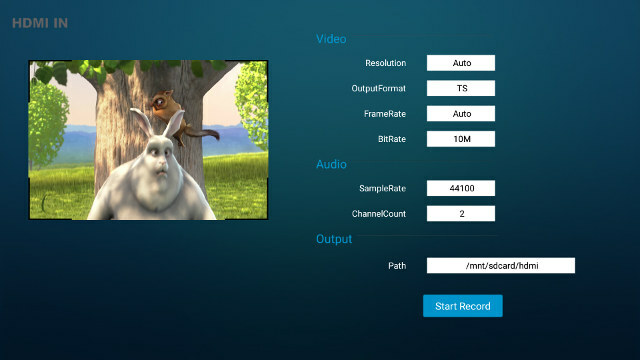 Bear in mind that while Realtek RTD1295 supports 10-bit HEVC/H.265 up to 60 fps @ 4K, H.264 is limited to 24 Hz, which will be a problem with you shot 4K H.264 30 fps videos with a camera or your smartphone, and 4K VP9 @ 60 fps is supposed to be supported, and with DDR4 memory I had hope some progress may be made here, but unfortunately the limit is really 30 fps, which could be an issue with some (downloaded) YouTube videos. 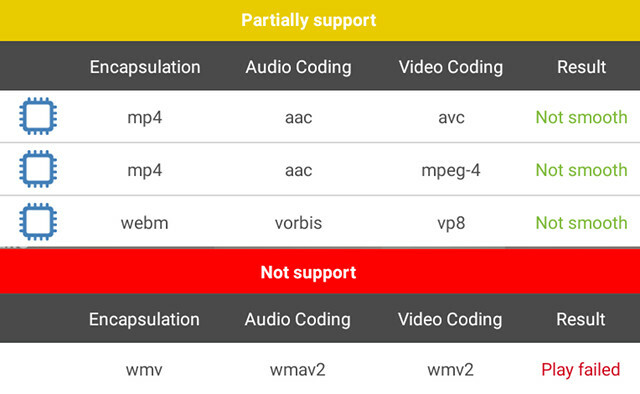 Out of Specs videos are prefixed with OoO. For some reasons Kodi 16.1 will fail to start playing some videos the first time, but play them the second time. Just like on Zidoo X9S – but worse – Kodi 16.1 implementation is not as good as the internal player, so for best user experience you’d have to use the 4K player. Automatic refresh rate switching works with 4K app, with 23.975/24Hz, 25 Hz, 29.97 Hz and 59.94 Hz with the latest firmware. It does not work at all with Kodi. For so the audio tests, I’ve stopped using Kodi, and only used 4K app with PCM 2.0 downmixing and audio pass-through via HDMI. So HDMI audio pass-through is working very well, and I did not experience some of the audio cuts I had on Zidoo X9S with Onkyo TX-NR636 receiver. Those may have been fixed since Zidoo X9S review however. .. and subtitle options while playing a video. I’ve also quickly tested Blu-ray ISOs (Sintel and Amat videos) and both could play. Finally, I play a 2-hour 1080p video to make sure the system can play a full movie, which I does. 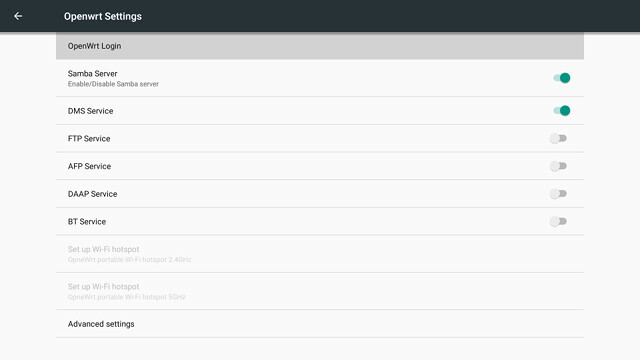 Antutu Video Tester score (820 points) is a little lower than on Zidoo X9S (888). DRM info crashed each time, just like on X9S, so there’s problably no DRM support at all. Eweat R9 Plus HDMIRecorder, as its name implies, allows you to record video from an HDMI input source. It can record up to 1080p @ 30 fps using H.264 codec in TS or MP4 container format, with a bitrate up to 10Mbit/s. It will also record audio, and you can select the output with the “Path” field. It will create a new “hdmi” directory to store the recorded videos. Once recording has started, it will work in the background (see recording info in the top right corner below) and you can browse the web, watch other videos, and so on during recording. I could then connect to the device via SAMBA, and play with the recorded video with both Totem player ad VLC in my Ubuntu 16.04 computer. That part works fine, and looks similar to Zidoo HDMI In app, however it lacks some goodies like PiP support and UDP broadcasting found in Zidoo X9S. So if so those functions are important to you, Zidoo X9S clearly has an edge of Eweat device here. If you want to learn more about settings up OpenWrt on Eweat R9 Plus, I’ll redirect you to OpenWrt and NAS functions section of Zidoo X9S review as all features are identical. 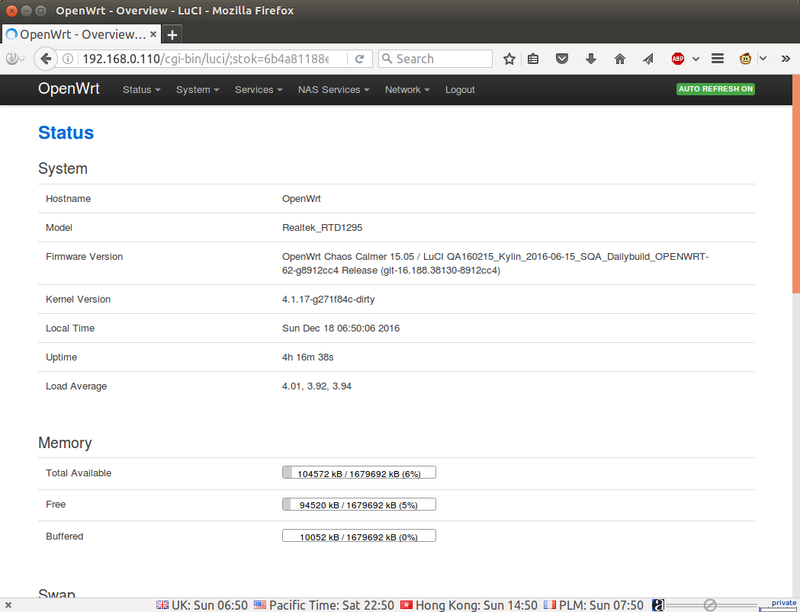 … and fine tune OpenWrt settings through LuCi web interface. I tested SAMBA, FTP, and Bittorrent. Performance on Eweat R9 Plus was very good with FTP transfer at ~105 MB/s, and 40 MB/s for SAMBA file copy to the internal SATA, very similar to Zidoo X9S with respectively about 90 MB/s and 50 MB/s. Contrary to my experience with Zidoo X9S, BitTorrent worked just fine and the transfer quickly saturated my 20 Mbps Internet connection. Bear in mind that firmware evolves overtime and it’s quite possible Zidoo has already fixed the issue. opkg update Downloading http://downloads.openwrt.org/chaos_calmer/15.05/rtd1295/mnas_emmc/packages/base/Packages.gz. wget: server returned error: HTTP/1.1 404 Not Found Downloading http://downloads.openwrt.org/chaos_calmer/15.05/rtd1295/mnas_emmc/packages/base/Packages.sig. wget: server returned error: HTTP/1.1 404 Not Found Signature check failed. Remove wrong Signature file. Collected errors: * opkg_download: Failed to download http://downloads.openwrt.org/chaos_calmer/15.05/rtd1295/mnas_emmc/packages/base/Packages.gz, wget returned 1. * opkg_download: Failed to download http://downloads.openwrt.org/chaos_calmer/15.05/rtd1295/mnas_emmc/packages/base/Packages.sig, wget returned 1. * opkg_download: Failed to download http://downloads.openwrt.org/chaos_calmer/15.05/rtd1295/mnas_emmc/packages/base/Packages.gz, wget returned 1. * opkg_download: Failed to download http://downloads.openwrt.org/chaos_calmer/15.05/rtd1295/mnas_emmc/packages/base/Packages.sig, wget returned 1. So if you want to install packages, you’d probably have to build them yourself, or copy and install opkg packages built for ARM architecture manually. We’ve already seen Gigabit Ethernet works perfectly above with transfers at 105 MB/s through FTP basically saturing the Gigabit Ethernet bandwidth, so I’ll only focus on WiFi in the network performance section. Eweat R9 Plus has excellent WiFi performance with both 802.11n @ 2.4 GHz, and 802.11ac (433 Mbps), roughly matching Zidoo X9S equally good performance. All you need to know is that Eweat R9 Plus is one of the top devices for WiFi for all devices I’ve tested over the year. I could pair Vernee Apollo Lite Android smartphone with “Realtek Bluetooth”, however once I started transferring files from my phone to the device, I either got the message “Unfortunately Bluetooth has stopped”, and when lucky, the transfer was initiated with Eweat R9 Plus showing an overlay message reading “”Incoming file from another device, please confirm…”. That’s all good but since there’s no notification bar, and no pop-up window, I had no idea where to confirm the transfer, and it eventually time out. I could not test Bluetooth Low Energy, because all my device are either broken or lost. Bluetooth is not completely useless however, as I could get Sixaxis to work with my PS3 BT gamepad clone, and I paired X1T Bluetooth earbuds successfully, and listen to a YouTube video. 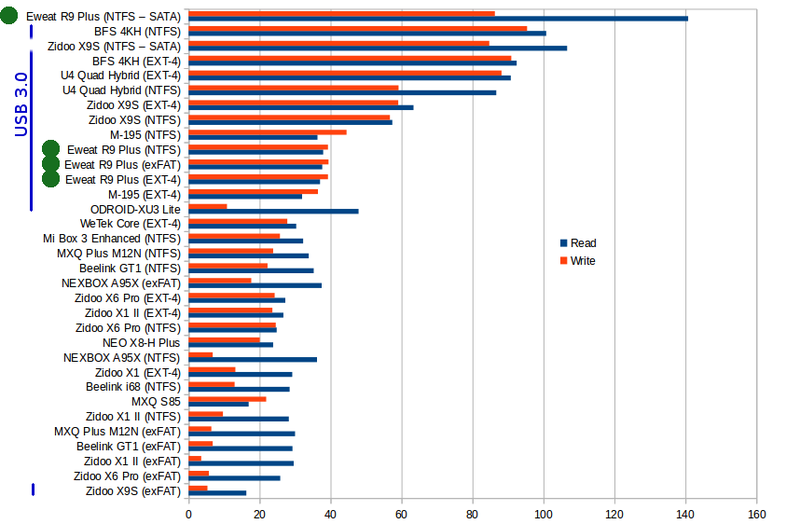 Eweat R9 Plus could mount NTFS, EXT-4, and NTFS partitions on a 1 TB USB 3.0 Seagate expansion harddrive with only BTRFS failing to be recognized. A FAT32 micro SD could also be mounted in read/write mode, as well as my SATA drive formatted with NTFS. Eweat R9 Plus looks faster than Zidoo X9S using SATA + NTFS, but bear in mind that the hard drive used was different, so it may explain the difference. However, Zidoo was quite better for USB 3.0 using EXT-4 and NTFS, but quite poor for exFAT, which R9 Plus appears to support well. I also measured internal storage performance, but unfortunately A1SD bench reported “Cached Read”, so the read speed is not valid. The write speed of about 55 MB/s is valid, and this is quite good. The actual read speed in the chart below should be lower than 140+ MB/s, but usually read speed is faster than write speed, so performance should still be good. I played Candy Crush Saga with the air mouse, and Beach Buggy Racing (with max quality) using a gamepad, and both games played perfectly well. Then I switched to Riptide GP2, again with maximum resolution settings. It’s started begin playable – but not quite 60fps – just like on Amlogic S905/S912 TV boxes, and Zidoo X9S, but then I noticed the image would freeze from time to time, and after a race was completed, it may have a 10 seconds black screen before going to the main menu. 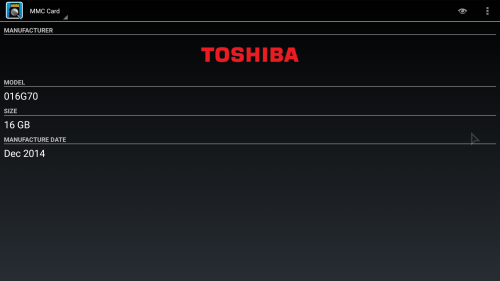 So I checked the CPU usage in OpenWrt (SSH terminal), and notice miniDLNA with a high CPU usage. So I disabled DMS in Android’s OpenWrt settings, miniDLNA stopped running, and I could play the game for 15 minutes more without issues, nor performance degradation over time. 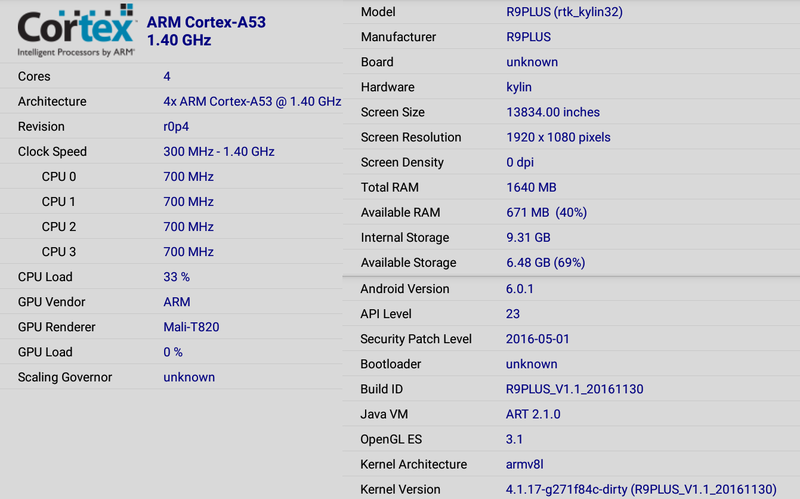 Let’s start with CPU-Z.. R9PLUS (rtk_kylin32) model with a quad core Cortex A53 processor @ 1.4 GHz and a Mali-T820 GPU, so no surprise here. The device reached 36,076 points in Antutu 6.2 against 34,976 points for Zidoo X9S Antutu score. There are a few potential explanations for the small difference: 1. R9 Plus firmware is more recent, 2. it’s winter here (~ 22 °C), and 3. R9 Plus has DDR4 ram instead of DDR3 RAM. 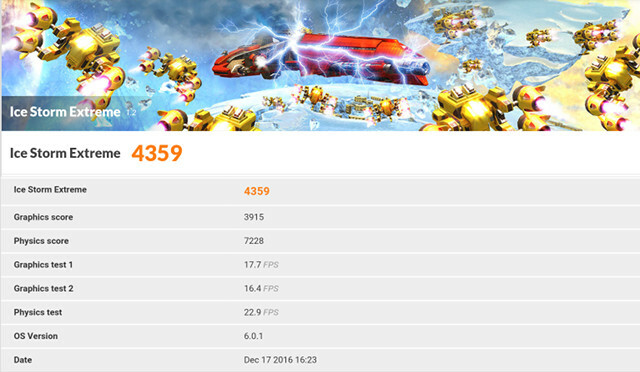 However the strange thing is that R9 Plus RAM score is 3,046 points, but Zidoo X9S got 3,960 points which does not make any sense. 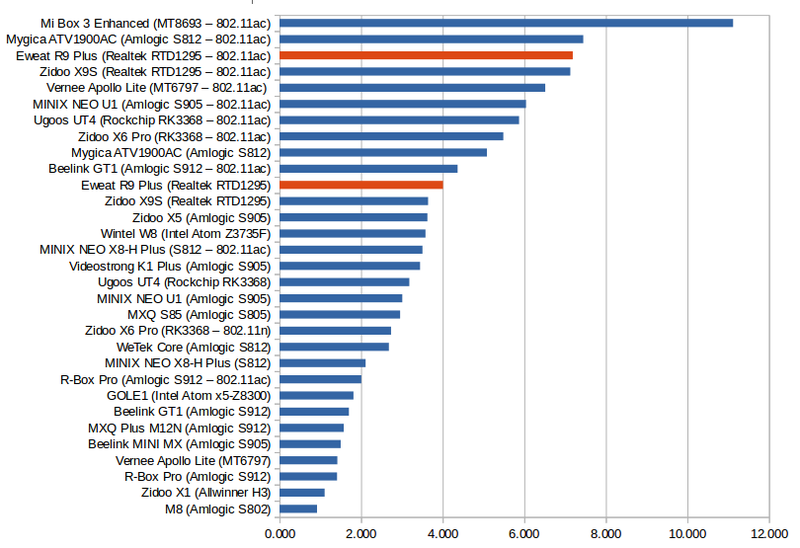 Vellamo 3.x scores are pretty similar with R9 Plus getting 1,430, 881 and 2,539 points for respectively multicore, metal, and Chrome Browser benchmarks, against 1,457, 831 and 2,638 points for Zidoo X9S. So it looks like DDR4 memory does not help for any benchmarks, including 3Dmark’s Ice Storm Extreme. 4,359 points for Eweat R9 Plus against 4,574 for X9S. Eweat R9 Plus is a solid device, and I really like the internal 3.5″ SATA bay, internal and external storage, as well as networking performance is really outstanding too. However I would have wished the firmware to have fewer bugs, and just like for Zidoo X9S, Realtek RTD1295 SoC has some limited 4K capabilities when it comes with H.264 and VP9. Getting the optimal performance may require some tweaks like disabling some server services. You’ll probably have to use both the include IR remote control AND a air mouse or other input device to fully use the device. A air mouse specifically designed for the box would be a plus. Tweaks may be needed (e.g. disable Media Storage and DMS) for optimal performance if you have a hard drive with many files. The system will not always remember the video output set by the user (e.g. 4K 60 Hz set, but falls back to 1080p or 720p). Eweat also lacks a community forum like Zidoo, but as long as they keep firmware updates rolling, it may or may not matter to you. Overall, Eweat R9 Plus is also a good device combining 4K TV box, OpenWrt NAS, and HDMI recording functions. Whether that’s right for you depends on your requirements and budget. The manufacturer sent me the review sample directly. Distributors can inquire the company to purchase in quantities, but if you just need one or a few you can purchase it on Aliexpress for $175.99 plus shipping (about $200) on Aliexpress. 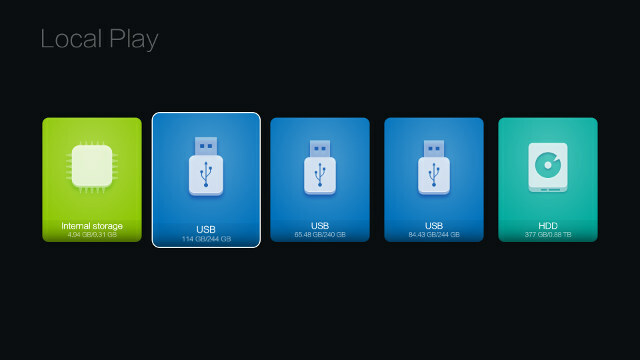 does all this devices with “hdmi input” have an app for capture and streaming to local network or wan? is it easy to do it through the Android (play store) or we have to use alternative Os? truehd stream have encapsulated atmos meta information [personally i streamed with mpc-hc or powerdvd to my marantz 6010]; maybe the OP’s avr isn’t capable to decode atmos at all? You need to use the app provided with the box, as I don’t think there’s a standard API for HDMI input in Android (yet). I have the latest firmware update, but I’ve never been able to get Atmos to work. It will always fallback to TrueHD 7.1. 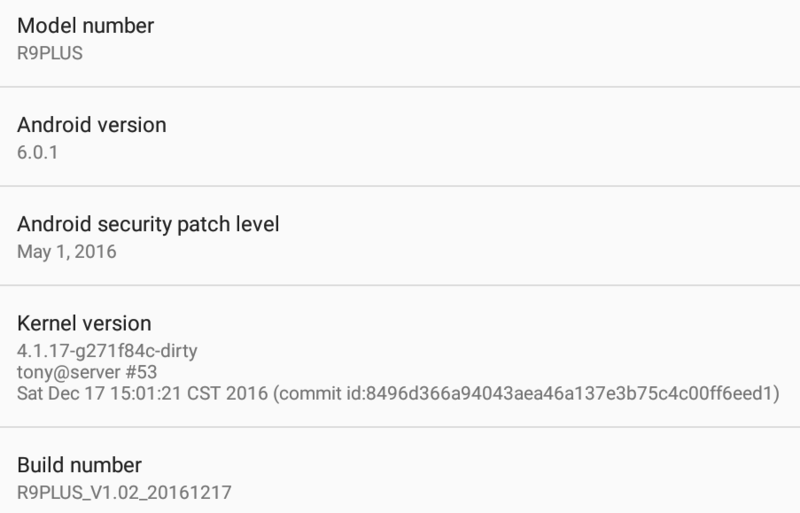 “Android security patch level: May 1, 2016” (even though kernel is dated 17th December 2016, so you know it’s not an old screenshot). This is a *BRAND NEW* factory device and they’re already shipping it with security vulnerabilities and 7 months behind on security patches. So you can guarantee it’s not going to be supported and patched. There’s no way in hell I’d buy a device like this. Please start taking note of these issues in reviews. We’ve already seen the kind of damage things like Mirai botnet etc are capable of (taking down DynDNS, Github, Twitter, etc). SECURITY MATTERS – EVEN ON DEVICES WITHOUT SECURE DATA. They can intercept traffic on the same network (what else do you do on the same home LAN/WiFi? ), they can attack other networks, they can host malware, etc. Manufacturers should be held to account and consumers should boycott this kind of insecure rubbish. Pls infrom which router you used? How you receive less that 8Mbait/sec on R9 и x9s? 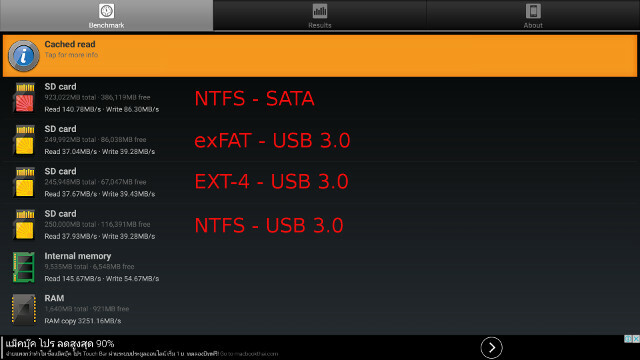 I used router Asus N56U (Padavan ) and SanDisk Pro 128 GB in USB3 as target for file. Router and x9s were near each other (1 metre). I found that mode of WiFi affect significatly to speed. Mixed modes, like a/n/ac Mixed(*), showed the best speed. We have like this results in Russian forum, user niklex, report for 22-27MBait/sec. I’m sure R9 has like x9s results. I also find R9 Plus has about the same results as Zidoo X9S. Both very good. and another TP-Link router for 2.4 GHz transfers. FYI. They are not in the same room as the device under test. You cannot compare your results to mine. But it’s not clear test if you have router in another room. We need to understund MAX speed in ideal conditions to compare devices and understund what we will have at home. Each owner has specifics with router’s location. Although, when I placed router to another room I had speed near your tests results for 2.4Ghz. 5Ghz showed worse results in such location. At least you should point about device location…. And another question – were all devices in table tested at the same conditions? (router, location..)? Just to make sure do you mean MByte/sec or Mbit/sec. Google translate says “Megabytes/sec”, is that correct? I understand your point, but if you are going to have a router in the same room or even table as the device, you should really use a Ethernet cable, so it’s not a realistic use case. The purpose of my test is to compare the performance of between devices. Yes all devices are tested in the same location, and I have not changed the firmware nor location of the routers. If the firmware of the router is updated, all previous tests are invalidated. Thanks for your answer, I specially writes MBytes/sec (Megabytes/sec) to exlude missundestunding. File with 1GB size was copied to box for 34sec. Another owner had speed – 22-27MBait/sec (devices near each other). And I can’t agree with usuing Ethernet cable – if we have WiFi with such speed we really needn’t cable in fact(same room). Instead, we need cable it if TV box is located in another room and we wish to see all content from Samba sharing dir. 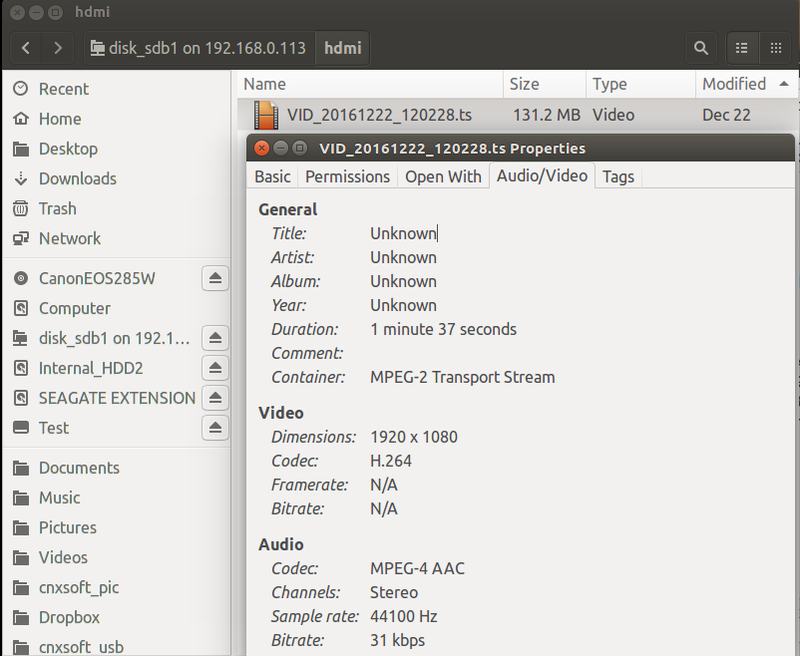 Even 8MB/sec(WiFi) will be not enough to see, as example, for MVC 3D FHD movie with DTS-HD (we need here about 13.5MB/sec). Another point – sometimes people has flat after home improvement and don’t like new cabels :). I don’t see one my message. See – for example, i’m looking for new TV Box, I must use WiFI, router and TV Box will be located at the same room. Which device i should by if I need the box with the best WiFi(main condition)? How I can select device from that table? Maybe one was in moderation. If both device are at the top of the range, then you can be sure it’s one of the best device for WiFi. I could also reverse the argument and complain about people who only test why with the device close to the router, since my router is in another room, and I want to know if WiFi will be good enough to watch 1080p videos @ 10 Mbps. WiFi performance is also not as constant as Ethernet performance, and may vary from day to day, so I would always recommend people to use an Ethernet cable whenever possible. The bottom line is that I won’t move my WiFi routers, as I have data spanning over two years of testing. I agree, that ethernet is the best … but not always possible. — I want to know if WiFi will be good enough to watch 1080p videos @ 10 Mbps. regarding WiFi – times change, for example I never had issues with Ipad Pro in my flat. I’m sure X9s will allow to watch 1080p videos @ 10 Mbps, because it has factor of safety. Even if speed down to 40%(neighbours networks,.. ) you will have your content. (we are about same room). –sure it’s one of the best device for WiFi. No answer which will be the best at the same room. I guees Zido X9s will beat NEO U1 at least twice. In fact we don’t know, because we havent clear tests for NEO U1. Download 179,55 Mbits (about 17 MegaBytes). Each tester has own results depends of …. I’d never use Speedtest to check WiFi performance, since it could just be testing your ISP performance. Anyway, WiFi will depend on many factors, sometimes I have planes flying over my home, and they seem to impact WiFi. Maybe if you move furniture in your room, the performance may be impacted too. You are right, it mean that at home Wifi will have better speed. 178.55Mbits with ISP, may be 250Mbits at home (and user had wall between router and TV Box) and only 60Mbits in your review for NEO U1. Anyway, WiFi will depend on many factors, sometimes I have planes flying over my home, and they seem to impact WiFi. Yes, yes, yes and I mean for readers is interesting to know the MAX possible WiFi Speed of TV Box. but in another room both of them will be able to show only 80Mbits. but it will be better if you add tests in ideal conditions for next articles. Let us say Router and TV box at the same room in 4-6 meters. I know a lot of owners who use TV Box at the same room as router. Well known fact about compatibility between Chinese TB Boxes and routers. My routers are already 3 and 5 meters from the box, but there’s just a wall, and in one case a door/wall between them. I’m not going to move the routers inside the room for testing. Not necessary to move router. 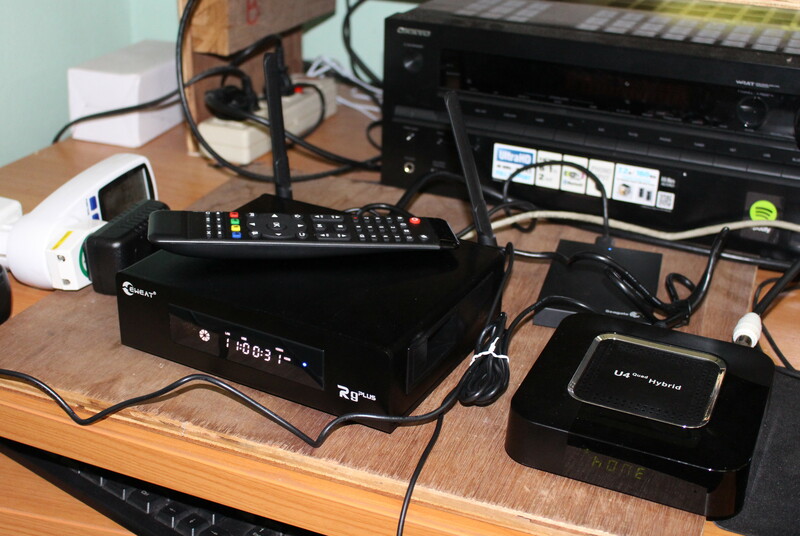 See, – Move TV Box to place near router, connect Ethernet, turn on it without TV(Monitor) – it take a min. 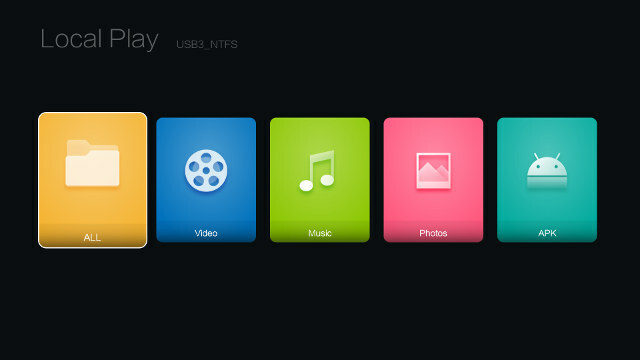 I had by using Media Center(File manager) on TV Box (samba disk, select file, copy, go to local disk – paste). Connect SSD device to SATA or USB3 (to avoid any delays). Copy files from PC to this disk from Windows Explorer(to mapped disk). –The write speed of about 55 MB/s is however, and this is quite good. 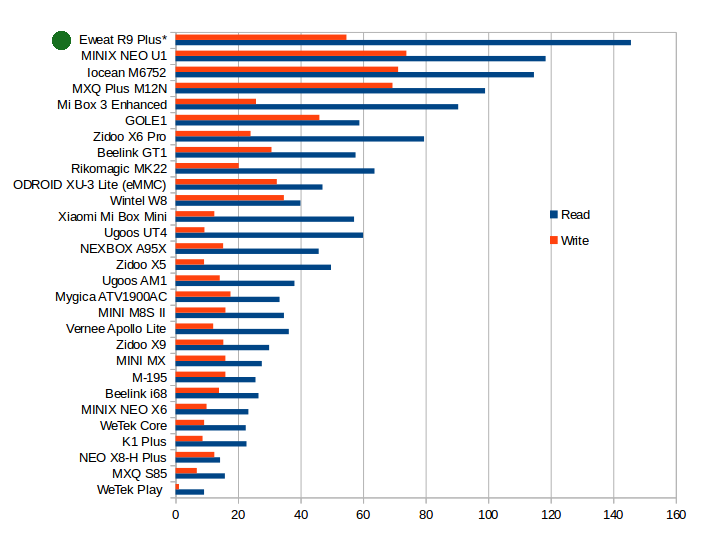 Very good results – My ZIDO X9S has only 13MB/s for writing. I’m really thinking to change X9S to Eweat R9 Plus. but in Production they use slow RAM of Samsung. I don’t like such aproach. 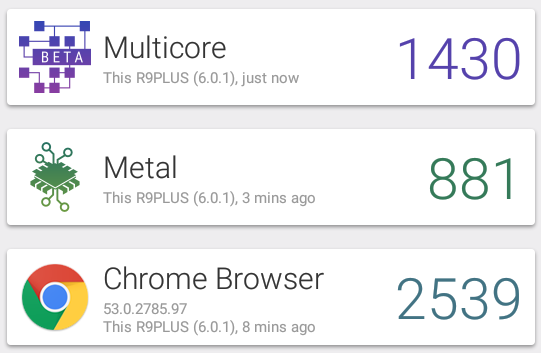 It should not affect device performance that much, unless it’s below 5 MB/s. The most important is actually random I/O but it’s not measured by default in A1SD. You can do it, but it require rebooting the box I think. I agree that 13MB/s is quite enough, but I think you also agree that it’s shamelessly to use such approach – send to reviewers one version and use in Prod another with cheaper components. Owners of ZIDO X9S with Samsung eMMC also have issues with starting of Asfalt 8 – short system hanging with sounds like “bzzzz”. Try to partition it and format it in Windows first.